A few months back, a couple decided to start all over with the goal of building a home that can help them save more on energy costs. Their new home will include features that will help them rely less on their HVAC units and consequently lower their energy bills. Renewal by Andersen® of St. Louis wants to help you achieve this kind of home. In this article, we will share some residential projects that can help you save more energy. As a reliable Chesterfield, Missouri windows company, we offer windows that can help make your home cozier. We provide an array of windows that come with insulated glass that can help regulate heat in your home. This can reduce heat transfer in and out of your home, making it more livable. They also come with insulated frames that can improve your home’s comfort levels. With these features, you can be sure that you will save a lot on your energy costs. Aside from our windows, our patio doors also come with gas-filled glass that can help reduce heat that enters and leaves your home. These glass options do a great job of keeping your home cooler during summer. This will help keep you from using your HVAC units too much, leading to more energy savings. Expect us to provide you with airtight replacement windows in Chesterfield, MO. Our years of experience allow us to install your windows in the best way possible. We will fill the spaces between the frame of your home and your new doors and windows with insulated foam. This will promote a more comfortable environment by ensuring that no drafts enter your home. These factors will keep you from using too much of your cooling and heating systems, keeping your energy bills low. 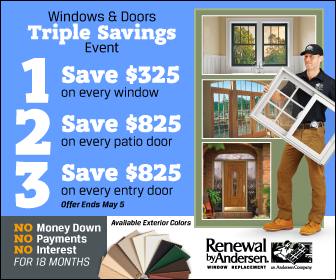 Count on Renewal by Andersen of St. Louis to help you get closer to your ideal home through these projects. Call us today at (314) 332-2364 or fill out our request form to get started.